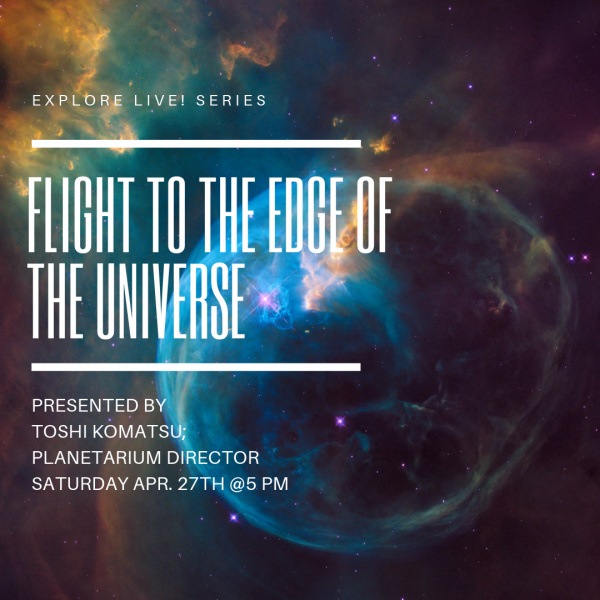 This is a live astronomy event presented by Toshi Komatsu, Planetarium Director. The Universe is big and vast and complicated. But one of the most amazing feats of human ingenuity is we can understand what is out there. Far, far beyond our one little planet, we are orbiting one star orbiting one galaxy among 200 hundred billion galaxies. Between here and there are planets of all types and sizes, galaxies, and superclusters of galaxies. Come take an immersive tour of the Universe, starting from Earth and sailing across billions of light-years right out to the visible edge, and still be back in time for dinner. For audiences 8 years or older.